This lady was diagnosed with rosacea by her doctor who then put her on a course of anti-biotics. These were unsuccessful in her treatment so she was then prescribed the pill and a topical ointment called Rozex for 5 months. When these also failed to produce results, the GP referred her to a dermatologist but there was a waiting list to be seen. 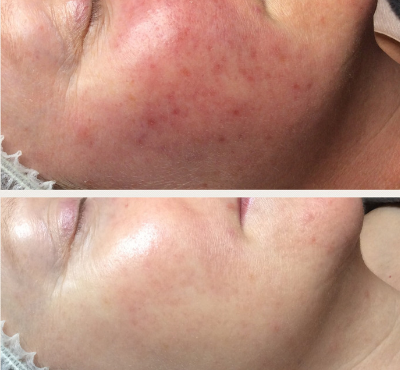 Whilst waiting for the appointment to come up with the dermatologist, this client came to see us in May 2017. As seen in the pictures, her skin was clear by November 2017. She was prescribed homecare during her Skin Fitness Assessment and she attended the clinic for monthly treatments. One day in clinic, she mentioned to us that her skin is so good but it could flare up a little when she went away on holidays…. which meant having a glass of wine, dessert or bread more than usual. We recommended our Skin Specific Probiotic and the next time she indulged without any side-effects. Needless to say that when the appointment came through with the dermatologist, she cancelled it. She would now say that she “forgets she had bad skin”.